As your Advocate Marketing program grows, you may need to seek help from members of your organization to manage some day to day tasks. With Role Management, you have the ability to give users certain permissions, while restricting their access to other areas of your AdvocateHub. The two default system roles are the Administrator and the Author. Authors have most of the abilities of a regular administrator, but lack the ability to publish or approve challenges and rewards - you can learn more about them here. Essentially the author can create in the hub but can’t publish anything to the advocates, so an admin can confirm everything that goes to the advocates. If you want a user with slightly more or less permissions, like an editor or just a group admin you can create custom users with different permission sets. Begin by navigating to Settings > System > Role Management. You will encounter the settings page below. 1. 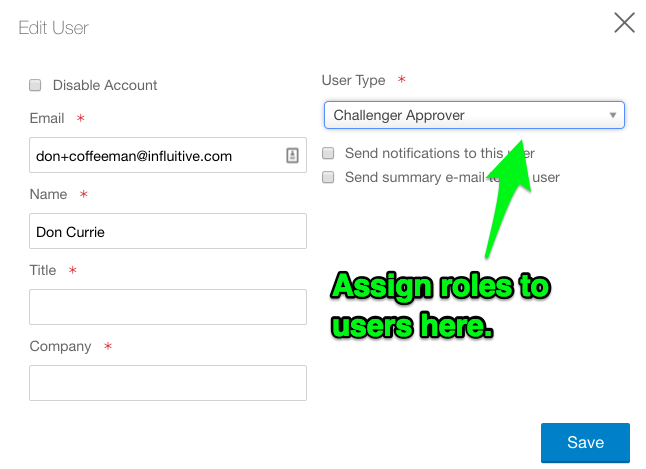 Click on the Add Role button to create a new user role to configure your new role with the desired permissions. 2. First, enter a descriptive name and clear description of the role you are creating. Next, choose the permissions you'd like to grant to this user. Remember that the permissions granted here are modifying the base permission set described in the table at the beginning of this article. Once you create the user role it will be available when you add a user in the User Management settings page (Settings > System > User Management). The various user roles created here will be under the User Type dropdown menu. You can delete any user role by hovering over the right side of the list and clicking the 'x' which appears. Note: You cannot delete roles which currently have users associated with them.